Digunakan untuk mengatur background suatu area atau bagian dalam halaman website. background-attachment digunakan untuk mengatur posisi background gambar pada halaman website, dimana background gambar dapat di set statis, sehingga walaupun pengunjung menggerakan scroll browser ke atas atau ke bawah, background akan tetap pada posisinya. Bagaimana CSS dapat mengenali bagian – bagian dalam halaman html? According to the story, this lake was made by nobles Mataram “Rangga Jagad Syahadana”, which eventually became known as “Mbah Jalun”. He is a fugitive who escaped from the Royal Dutch Mataran because colonists hunted in the early 1800s. After hiding in the sultanates of Central Java, Mbah Jalun finally settled in the Sultanate of Banten. Prior to Sukabumi, according to legend, Mbah Jalun Brass marry a woman from West Java. Lane departure itself through Cianjur. Because it is still a fugitive Netherlands, the road passes more open forests in the mountains. One of the opening of the path is the path through Mount Gede and Pangrango. This trip is full of natural challenges, such as the winding roads and lush forests inhabited by wild animals. After a long walk with his wife, Mbah Jalun finally stopped in a valley by flowing clear river water. He then decided to settle in the area. A few years later, namely in 1814, the couple was blessed with a son named Rangga Jaka Lulunta. As an act of gratitude for the birth of his son, he built a small lake within seven days with simple equipment, such as a buffalo skin conveyance of land. 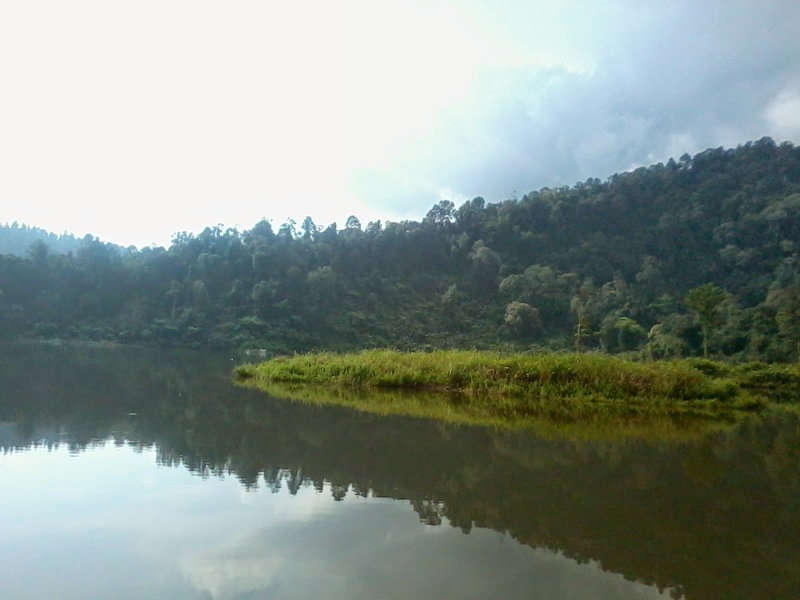 Completed, the lake he named Situ Gunung, meaning that exist in the mountain lakes. However, the Dutch finally smelt Situ Gunung, and was amazed at the sight of the beauty of the artificial lake, especially when he knew the lake was created by a fugitive. In 1840, Mbah Jalun caught and sentenced to hang. But, before the implementation of the death penalty which is planned to be held in the square Cisaat, he managed to escape. Syahadana himself died in 1841 in Bogor. However, until now his tomb is still kept secret by his descendants.